Anyone who follows my blog knows that I've been preparing for this past weekend for many months now; or perhaps even, many years. It was 21 months ago that Nick asked my best friend of the past 19 years to be his wife. So it was a happy day and truly the most fabulous wedding I've ever been to. And no I'm not just saying that cuz I was the Maid of Honor. Even a local celebrity showing up to personally serenade the couple! When you're in our age range, you go to LOTS of weddings. I think they started around 4 years ago and haven't stopped - each year seems to bring more and more. And while the Bay Area is a very big place, I've now been to 4-5 weddings where the ceremony or reception brings me back to a place I've "wedding-ed at" before. This was absolutely not one of those weddings. I knew it'd be spectacular when Deb and Nick found that the Ferry Building had an event space upstairs. A wedding at the FERRY BUILDING?? F/4.5, 1/2 s., ISO 400 and HAND HELD!! Pictures of Deb, Nick and their parents -- LOVED those soaring ceilings and the lighting! Having a wedding in San Francisco truly puts you in the spotlight for the day. Not only do your guests gaze upon the beautiful and happy couple but so do hundreds of tourists! As we (the bridal party) wound our way through a few city landmarks for pictures, I lost count of the friendly tennis shoe-donned, backpack-laden tourists excited that their sightseeing came complete with a drop dead gorgeous bride in a fairy princess dress...oh and a groom too. ;) Many a traveler went home with pictures of Debbie and Nick stored away on their point & shoots. Just as I suspected, Deb's wedding felt a little bit like I imagine my own will. I mean, our guestlists would probably be 25% the same - which is a large number when you think about all the [parents'] friends and family who attended! But it was still very much her wedding. Deb planned and executed this wedding perfectly. As of course I would have expected her to. The flowers, the food, the music, the vibe. It was Deb - and Nick too. I'm still hearing people say it now - days later... from folks who aren't as biased as I: "One of the best weddings I've ever been to." Well, I agree. And for the rest of my life, I'll never forget this day. Of course people actually called me that in elementary school. It's truly hilarious when you're 7. I was a little bit disappointed and a little bit excited to find that Rosa had chosen PIZZA as our October Daring Bakers Challenge. 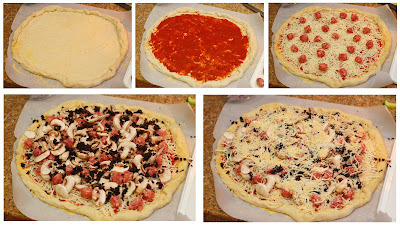 Disappointed because I've been making a lot of pizza lately - so it's not really much of a challenge. But excited because it's always nice to try another recipe and perhaps try to get creative with it. We all did Peter Reinhart's recipe from The Bread Baker's Apprentice: Mastering the Art of Extraordinary Bread - same book we used last month! 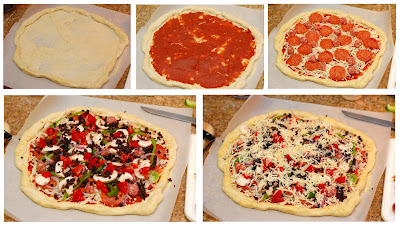 Rosa asked us to make the pizza dough and cover it with a sauce and toppings. We could choose the sauce and toppings as long as we had both! First I thought I'd do a dessert pizza and skip the savory altogether since I've been making so much lately. So I started brainstorming dessert pizza ideas. But soon plans developed for my parents to be over one weekend and while I've made lots of pizza for friends and even for my brother; I hadn't made any for my parents. So savory was back on! Enough with the pizza making! Can a girl get some sleep?! The dessert one was a little bit harder to think up - or maybe I should say it was difficult to settle on one! So I did half and half. I love to end on a sweet note! It's been busy around here. My best friend's wedding is next Saturday and there's many-a-thing for me to do. Yes, even little 'ol me. Certainly not as much as the bride. But as the Maid of Honor I am some responsibilities - some helping the bride and some the bride doesn't even know about. (Hmmm I doubt she'll have time to read my blog this week anyway.) But enough about that! I somehow managed to squeeze in a dessert for a friend's get-together last Saturday night. I wracked my brain for a while on what to make. These friends know I bake pretty well, so I didn't want to show up with chocolate chip cookies! This is actually my cousin, Sue's recipe. It's a dessert she's become a little famous for making for our Thanksgivings each year. My brother always gets seconds, all the while exclaiming about how much "bad stuff" goes into it. I guess it's not enough to faze him. I could have gone way fancy and used an expensive semi-sweet chocolate. But Sue's recipe called for chocolate chips, so chocolate chips I used. Let me tell you - no one complained about the quality of the chocolate as they were digging in. Fold, fold, fold = mousse! Chocolate mousse - or mousse of any kind is really quite easy. You make the "flavor" (in this case a rich chocolate sauce; lemon mousse you'd start with a tangy lemon curd), whip up some cream and fold them together: MOUSSE! Don't you hate it when this happens? You have a blank slate on which to decorate. You have no idea what you want to do; so you just start. And it's awful and ugly? And you can't really scrape it off and start again since you can now see remnants of the decorations? So you scrape it off anyway and just cover the entire top with whipping cream? Um, yea I don't know anything about that. Just cover the whole top ------------- Ready to serve! The nice thing about this dessert is that it's so rich, you only need to cut tiny slices. No one needs a huge wedge. So a little goes a long way. One homemade dessert for a group of ~25! Can't you just tell it melts in your mouth?